chances to speak about themselves and ask about others. who are interested in joining us. Don’t miss our next Ad.! 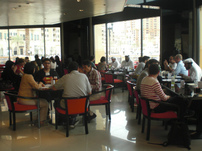 We held a Japanese conversation event at the same café as the previous “Let’s Talk Japanese”event. Many Japanese language learners and Japanese native speakers came and enjoyed meeting each other and conversing in Japanese. Everyone had a great time. اليابانية بين دارسي اللغة ورابطة معلمي اللغة اليابانية وأصدقائهم من اليابانيين. وقد اثني الجميع على اللقاء الذي كان ممتعا. We held a café meeting, many Japanese language learners and Japanese people came and had joined us to enjoy the free talk in Japanese.